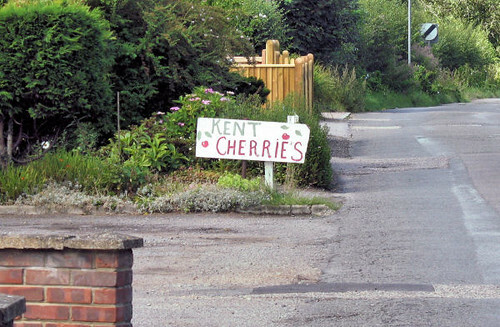 As soon as this sign appears in our village, you know that the cherry season is with us. Even though the season is short, we try to make the most of the cherries, and this year they are really big and juicy. Some left-over chocolate cake can be made into a simple Black Forest trifle, no recipe as it's one of those things you just throw together. In the bottom of a serving glass, or dish, I spooned a little chocolate ganache (chocolate sauce would be just as good), on top of that I put some chocolate sponge. I then added some halved and stoned cherries that had been marinated in a few tablespoons of kirsch (pour the juice and liqueur over the sponge). Top with some lightly whipped double cream and some grated chocolate. Nic, this looks so delish! This looks so pretty in the photo, Nic. It really makes me want to take a spoon and dig into that dish for the cherries. British cherries. I will try and keep my eye out for them in Scotland. But I am fortunate, tomorrow I am travelling down to see my in laws in Essex so may get the chance to pick some English cherries whilst I am down there. I agree with Heatherfeather, I also want to tuck in with a big big spoon. I love all the fresh cherries around right now! yum!! Great use for them in the trifle :) beautiful pic! Hi Nic, I adore fresh picked cherries and oh boy your black forest trifle tempts the eye - YUM! One of our patients brought in 2 flats of cheeries...needless to say i have been looking for ideas. I live in Kent too, and we recently picked 2lbs of lovely cherries, to be made into cherry jam and chutney! Fabulous idea of using leftover choc cake for black forest . Kent Cherry sounds really good. Oh ! That's a luscious dessert ! Enjoy the cherry season ! Looks so delicious! I'm very jealous as I've given up trying to find English cherries here. Heatherfeather - hi there, thanks so much. Hope you survived the move and are settling in. mangocheeks - I'll keep my fingers crossed that you find some! Jennifer - aren't cherries wonderful? Thanks so much for your comment! KennyT - Yummy is right! Thank you!! Rosie - me too, and thanks! Valli - oooh, nice patient! Grace - well anything with chocolate in is good, right?? I bet your trifle was fabulous! HC - welcome! Cherry jam and chutney sounds superb! Jules - you will have to come down here, they sell them at the roadside. Fabulous! I usually make trifles with pound cake... but this is so much better--and chocolate! Will definitely mention on DyingforChocolate. The cherry season is just too short. I have been really enjoying the season too. Can't seem to get enough! Looks gorgeous Nic. I've never picked my own cherries but they look so ripe! The dessert looks yummy. Mmmm, cherries are one of my favorite fruits. I recently bought a cherry pitter, it is so much easier to get those cherries into loads of goodies! :) Those treats you made look delicious! The black forest trifle sounds so lovely,....mmmmmmmmmmmm,..;excellent! I wish the cherry season was a bit longer, I guess I'll just have to make the most of them while they're here. The trifle looks really really good! I love, love, love cherries! I am smiling. I found some cherries while I was in Essex and picked them straight from the cherry tree. Pretty photos. I love cherries and am always looking for a recipe using Kirsch since I stocked up in Switzerland a few years ago. Who knew something that sounded so good could taste so vile on its own? It is good in recipes though. Thanks for the inspiration. YUM! That trifle looks divine, Nic! Mangocheeks - you were lucky as it's about the last week for them now. Enjoy! I've given you The Kreative Blogger award. Visit my blog for details. You may not believe this but I have just tasted cherries for the first time in my life. They are understandbly hard to impossible to get in the Caribbean and even when available the price is prohibitive. I love your trifle idea. Why does kirsch add so much sexiness to desserts? Craving black forest all of a sudden. 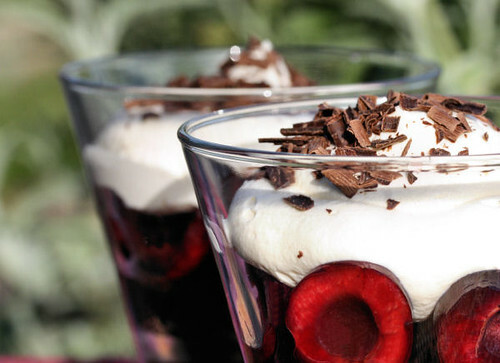 Do you know, black forest trifle is the only trifle I ever liked?? Yours looks simply gorgeous!